Enduro Racer (エンデューロレーサー) / Super Cross - Cheats - SMS Power! Press at the title screen. 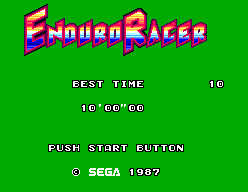 A number that corresponds to the starting level will appear on the top right corner to confirm correct code entry. Press and to select a level. Approach a jump at 200 kph and press at the top of the jump. The speed of your bike will remain at 200 kph. Then, press while in the air, and press just before your bike hits the ground. This will allow your bike to remain in the air for a longer amount of time.